Keep up with her latest developments here! I was excited about racing in the Second Annual SVRA Brickyard Vintage Racing Invitational on June 9-14, 2015. The plan was to compete in the Pro-Am, along with 32 other Indy 500 veterans in whatever car I was assigned. I was also entered in a 1988 Swift DB4 owned by Kurt Hansen. The Swift didn’t make it, so it was going to be a one-race event for me. For the Pro-Am, I originally was paired with the owner of a 1969 Corvette, but when I sat in it I basically disappeared. The owner was over 6′ tall and if we tried to get enough cushions so I could see I was literally out of the seat. After sitting in about five other cars Tony Parella, President of SVRA, helped me find one: a Cobra Mark IV – car #28 – that belonged to John McCormack out of Nashville TN. One small cushion and we were good to go! As I walked to the driver’s meeting late in the day I ran into Bruce Foss of Hoosier Tire. When I mentioned that the Swift wasn’t coming he asked if I wanted to run in the 90-minute enduro on Sunday morning. Naturally, I said sure! So, after the driver’s meeting, I stopped back in their garage and met Kris of K-Hill Motorsports and Bruce Hamilton, the owner of a 2008 Dallara Indy Lights #85 (he also was running a beautiful Brabham). We worked on seeing if I could fit in the car, which we were able to make happen. I spoke to Ray Snowden, SVRA Chief Steward, to see if I could take a few laps in another group practice session the next day. We worked it out. So I got a few laps of practice in. Twenty years ago, the defending champions failed to qualify for Race Day. A first-lap, first-turn crash left one driver unconscious and several others rattled. In the final laps, a driver named Goodyear, on Firestone tires, had the lead one moment and agony the next – all without ever slowing down. This was the 1995 Indianapolis 500. As the 79th Indianapolis 500 crawled under caution with 10 laps to go, Jacques Villeneuve danced his car left and right down the backstretch in a tactical chess game. Eighteen cars remained on the track, but that moment belonged to just two, the leader and the follower: Scott Goodyear, a 35-year-old native of Ontario, Canada, and Jacques Villeneuve, a 24-year-old from Quebec. The view of the leader’s rear wing was familiar for Villeneuve. The previous year, at the 1994 Indianapolis 500, Villeneuve was a surprising runner-up. Sitting second a year later was even more of a surprise because he was in that slot after rebounding from a two-lap penalty, levied after he passed the Pace Car on Lap 36 of 200. 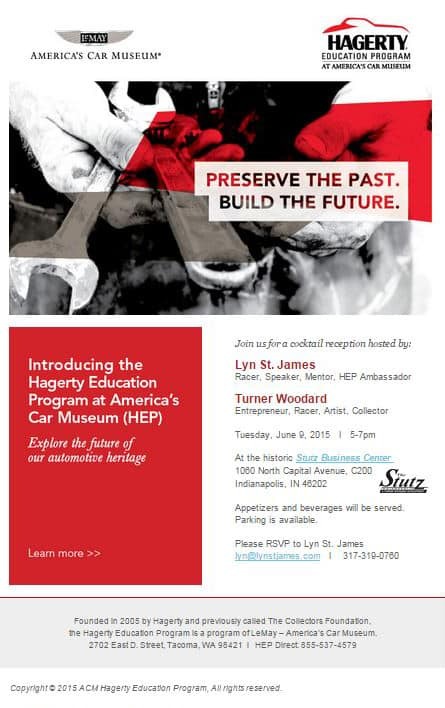 TACOMA, Wash. (May 19, 2015); – Automotive restoration and preservation education is entering the motorsports realm, thanks to record-breaking racer Lyn St. James, who was named an ambassador of the Hagerty Education Program at America’s Car Museum (HEP). HEP, a program dedicated to preparing young adults for careers in automotive restoration, supports hands-on, career based training for students in the United States and Canada. HEP is a program of ACM, the largest automotive museum in North America. Embracing HEP’s mission, St. James joins the team to increase visibility of the program. 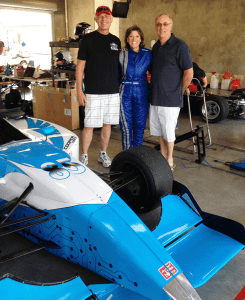 She has made significant contributions to motorsports both on and off the track, making history as the first woman to win the Indy 500 Rookie of the Year award in 1992. Additionally, St. James has raced for more than 40 years and has had victories at the 24 Hours of Daytona, 12 Hours of Sebring, Watkins Glen and Elkhart Lake races, set-closed course speed records of over 225 mph and launched a foundation to help women advance their careers in motorsports. The panel discussion, facilitated by Paola Boivin, sports columnist for Arizona Republic and Stefani Francis, Co-Founder and Managing Director of Navigate, will explore the panelists’ career highlights and what led them to a career in sports. They will also discuss their career challenges, transitional careers and what they project for women in sports for the future. Tickets are $50 ($40 for students). Each registration covers: cocktail reception, panel discussion, photo opportunities and one ticket to the Arizona Diamondbacks vs. Atlanta Braves game that begins at 6:40 that night (June 1 – all game tickets are located in the “All You Can Eat” section of the stadium). 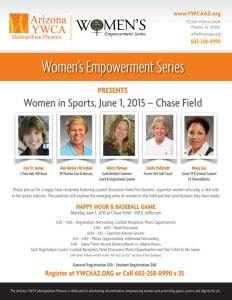 Attendees may click here to register online or call 602-258-0990 X11. YWCA Metropolitan Phoenix is dedicated to eliminating discrimination, empowering women and promoting peace, justice and dignity for all. Two of racing’s most influential women, Janet Guthrie and Lyn St. James will join Alice Hanks to discuss the evolution of women in racing at the 500 Festival Breakfast at the Brickyard presented by Midwestern Engineers, Inc. While women continue to make advancements in racing, just 60 years ago they were not permitted to set foot in the garage area – let alone competitively race. St. James, Guthrie and Hanks will discuss their experiences as trail blazers for women in auto racing and provide insight into racing’s evolution as women continue to push the sport forward. The panel will be moderated by television sports announcer, Bob Jenkins. First they stopped in to WISH-TV News 8 for a preview. Please click here to watch the video. 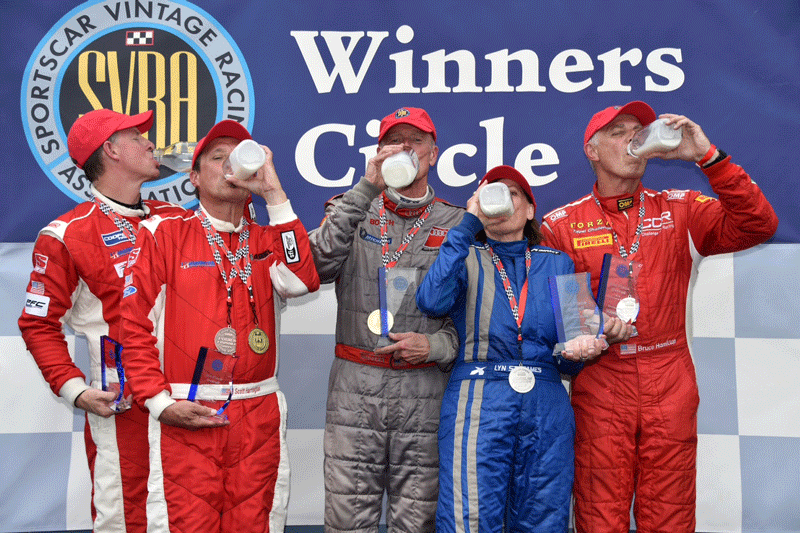 The Sportscar Vintage Racing Association (SVRA) recently announced the second running of the Brickyard Vintage Racing Invitational weekend at the famed Indianapolis Motor Speedway on June 11-14, 2015. As was the case in 2014, Lyn, Willy T. Ribbs and Mark Dinsmore were the first three drivers to sign on to the ‘Indy Legends Charity Pro-Am’ event. Scheduled for Saturday, June 13, this year’s Pro-Am promises an even larger field than last year where 24 drivers took the green flag. For the 2015 running, as many as 33 former Indianapolis 500 drivers are set to compete on the Speedway’s 2.43-mile Grand Prix road course track. As with the inaugural event, the cars for the Pro-­Am will be 1963 to 1972 vintage Corvettes, Camaros and Mustangs with an engine displacement limit of 355 cubic inches. The Indianapolis 500 veterans will be paired with amateur drivers in a 45-­minute timed race. The individual teams will determine how they split their time behind the wheel. Tony Parella is really taking vintage racing to the next level. The professionalism in their paddock is outstanding and I believe in his vision of establishing vintage racing as a recognized motorsports alternative for fans and drivers. The Pro-­Am cars and drivers will participate in a Fan Walk through on the starting grid prior to the opening ceremonies – which allows fans to see the cars up close, take photos and chat with the drivers. All entry fees will be donated to the Indianapolis Motor Speedway Hall of Fame Museum Foundation. In addition to running the SVRA’s 11 groups, there will also be a Car Show on the golf course on the IMS grounds. Over 1,000 cars expected to participate in the activities. The 50th Anniversary of Jimmy Clark’s first Indy 500 win will be celebrated with a display in front of the Pagoda. And, the Unser Family Reunion is also planned, with Al Unser Sr., Al Unser Jr., Bobby Unser and Robby Unser in attendance. On Saturday evening, a Driver and Crew party will be held under the stars, with a live concert by Blood, Sweat & Tears and a spectacular fireworks. Admission to dinner is by race credential only; the concert and fabulous fireworks display are open to all at no charge. 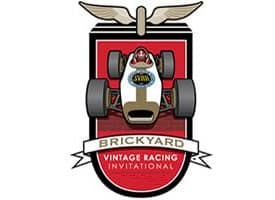 Fans can order Brickyard Vintage Racing Invitational tickets for all or any one of the four days of the event through the Speedway website or by calling 800-822-INDY or 317-­492-6700 between 8 a.m.-­5 p.m. (ET) Monday through Friday. Fans can also visit the ticket office at the IMS Administration Building at 4790 West 16th Street between 8 a.m.-­‐5 p.m. (ET) Monday through Friday. Tickets for groups of 20 or more also are available. Contact the IMS Group Sales Department at (866) 221-­8775 for more information. Children 12 and under are admitted free each day when accompanied by an adult. Tent camping passes in the IMS infield start at $30 and are available all four days as well. The Sportscar Vintage Racing Association is the premier vintage racing organization in the United States. Founded in 1981 by Ford Heacock III the SVRA has 2,000 members. It currently sanctions 18 events at some of the finest racing venues in the United States, including: the Indianapolis Motor Speedway, Sebring, Road America, Watkins Glen, Auto Club Speedway, Road Atlanta, Pocono Raceway, the Mid-­Ohio Sports Car Course, Sonoma Raceway, Portland International Raceway and Virginia International Raceway. The rapidly growing organization hosted the first U.S. Vintage Racing National Championships at the Circuit of the Americas in Austin, Texas in 2013. Further information on SVRA, a complete schedule for the weekend and an entry list can be found on the SVRA website. On Saturday, April 25, 2015 Lyn is slated to speak at Danville, California’s Blackhawk Automotive Museum – a Smithsonian Institution associate – as part of the museum’s Saturday Morning Lecture Series. The series is attracting a steady stream of top racers, engineers, mechanics, advertising agency executives and journalists. And with the high-profile lecturers, attendance has grown. As part of the museum’s spring roster, Lyn’s April 25 guest spot follows the March 7 appearance of former Formula One competitor Howden Ganley. Recently the San Jose Mercury News published a story detailing the pair of appearances. I’m blessed to have found the things I love to do in this world. There’s more inside us than we’re aware of. If you haven’t found fulfillment, keep going. With that, you can be empowered. The lecture is slated for 10:30 AM – NOON on Saturday, April 25. Admission is free for museum members; or included with $15 museum admission. For more information or additional details, please contact the museum directly at 925-736-2280. New York City based weblog Jalopnik recently released their list of the ‘Ten Most Successful Female Race Car Drivers Ever’ – and Lyn is ranked third! I have to say I was really shocked and honored to be so high on the list. Some awesome company! The list includes drivers and industry pioneers – from around the world and from the last century – whose successes who helped pave the way in the male-dominated world of motorsports for today’s contingent of talented female racers. Owned by Gawker Media, Jalopnik has emerged in recent years as a standout car, car culture and automotive industry internet news source. Motorsports enthusiast Sandy Cotterman recently reviewed one of Lyn’s books – An Incredible Journey – for the Racemaker Press website – part of the larger Motorsports Marketing Resources web community. This is one of those books that creates an incredible journey for the reader. 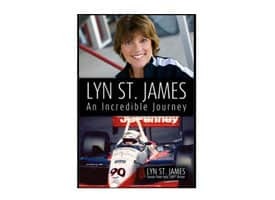 You’re strapped in behind the wheel with Lyn St. James, feeling every turn with the same excitement and tear jerking moments she felt throughout her remarkable career. More than an autobiography by a legendary race car driver, St. James captures the essence of racing in both an educational and inspirational way. I only wish someone had handed me this book when I first became interested in motorsports. St. James walks the reader behind the scenes of what it takes to become a race car driver, from chasing sponsorship dollars to getting back on the track after a crash … and everything in between. It’s an eye opener and she did it all with grace and determination. Lyn’s sense of humor and down to earth style comes through in her writing. She shares experiences in detail, often down to the second, and then translates them into positive messages on life. Many of these messages are summarized at the end of chapters as ‘Pit Stops’. This is just as much a motivational book as it is a story of Lyn St. James’ life. For all of us who have gotten hooked on racing just by being at the track, we know how the sounds, the smells, and the speed of the cars are electrifying. This is how it all started for Lyn. At age seventeen, sitting in the stands watching her first Indy race in 1966, she was captivated by the drama and fell ‘in love’ with Indy racing. Little did she know that her life would stay focused on the Indianapolis 500 for the next two decades. During an era when there were few female race car drivers, it was Lyn St. James herself who wanted to achieve on her own merits without special treatment. The stories she shares, from on and off the track, point to her deliberate care in making sure she was true to herself and to her chosen career. Although this book is appealing to both genders, Lyn speaks to her philosophy on supporting women across the board in all professions and especially those young women interested in pursuing a career in race car driving. The results of her own career goals have given her respect as both a driver and motivational speaker. The content of this book is divided into fifteen chapters with an Afterward titled The Future, describing Lyn’s inspiration to establish the Lyn St. James Foundation in 1993, renamed in 2002 to the Women in the Winner’s Circle Foundation. Once you pick up this book, I guarantee you won’t put it down. It’s a quick paced book. I would like to see it on required high school reading lists. Not only a historical autobiography of a famous female athlete, it also serves as a motivational book laying out guidelines and scenarios on life lessons very applicable to teenagers. The adult audience readership is not limited to race fans. It’s truly a book for everyone. It was hard to decide which chapters of this book I enjoyed most. If I had to choose, I would say Chapter One, titled, Drive the Course You’re Given, a glimpse into St. James first time racing. Also inspiring was Chapter Thirteen, The Glory of Teamwork. Lyn St. James was not someone who set out on a deliberate path to become a race car driver. The same year she got hooked on the excitement at Indy, Lyn entered a race on a dare. It’s amazing to read how a rather shy girl from Ohio ended up first racing on a drag strip. It would be another eight years, before she had a chance to feel that passion again … and it ended up to be one of those humbling life lessons which is humorous to read, but probably not to live as her 1973 Ford Pinto spun into the murky wetlands off the Palm Beach International Raceway. Lyn drove seven Indianapolis 500 races. Much of the book focuses on her initial quest for sponsorships and a team owner to take her on as a driver. Lyn’s last Indianapolis 500 race in 2000 covers several chapters focusing on her devastating crash during qualifying. In Chapter 13, she compares the remarkable ‘team effort’ to recover and qualify to run that race to her 1985 win at Watkins Glen in the Serengeti 500, where she chose to drive on her terms without the team, learning a hard, yet valuable, lesson on the importance of teamwork. To read this book, is to feel like you know this unique woman. Her positive attitude towards life is contagious. An Incredible Journey is available for purchase here on Lyn’s website.